Christians who study biblical prophecy have one overriding question that trumps all other questions about the future. That question is: When will Jesus Christ’s Second Coming occur? During his human lifetime, his disciples directly asked him that question as well (Matthew 24:3, Mark 13:4). Jesus’ answer was deliberately vague. He told them that the day or hour of his return was not only not known by any man, but also that even the angels of heaven did not possess that knowledge (Mark 13:30-33). Jesus’ answer said even he did not then have that knowledge, and that only the Father knew the answer to that question. However, Jesus did give a strong hint about the general timing of his return once the latter days of our age had arrived. This post is to give readers a commentary about his hint because we are now undoubtedly living in the latter days of this age. if any reader has doubts about that fact, please read my article, Are We Living in the Biblical Latter Days? for clear biblical evidence supporting that assertion. If a thief came into your residence in a home invasion, it would surely be an unexpected and shocking surprise. It may also occur at a time in the night when you were sleeping. Both these qualities will characterize Jesus Christ’s Second Coming. Not only will the world as a whole be surprised and shocked, but so will Jesus’ own followers. Let’s consider how this could possibly occur. Serious students of biblical prophecy are aware that there are a variety of prophetic timetables that offer some possibility for calculating latter-day events. Revelation 13:1-4 reveals the time of the beast’s reign on earth before Christ returns will be 42 months. The ministry of the Two Witnesses (see my article, The Two Witnesses) will be 1,260 days (Revelation 11:3). Daniel 12:9-13 includes two cryptic periods of latter-day time tables that will equal 1,290 and 1,335 days. Daniel 12:7 and Revelation 12:14 mention a cryptic period lasting “a time, times and half a time.” Different authors, scholars, and denominations have varying interpretations about these timetables and what major events are attached to their significance. Over the decades, I’ve heard or read many opinions about “what has to happen” according to these timetables “before Jesus Christ can return.” The expectations of many Christians who take prophecy seriously have been formed by sermons, lectures, and articles on the subject. I’d like to challenge these expectations. It may shock some people, but Jesus Christ himself said that strictly relying on biblical timetables to calculate expectations about when he will return will result in erroneous conclusions. Jesus addressed this subject specifically in his parable of the ten virgins in Matthew 25:1-13. In this parable, Jesus likens his latter-day followers to ten virgins who are expecting a “bridegroom” (Christ) to come for them in the morning. Since they “know” his scheduled arrival is not scheduled to happen until the next morning, they all go to sleep. At midnight (quite early in the nighttime sequence), they are roused from sleep by the shocking and unexpectedly early arrival of the “bridegroom” (Jesus Christ). Half the “virgins” have enough “oil” in their lamps to go meet the bridegroom, but half do not and their lamps “go out” before Jesus comes. Jesus warns that the virgins (real latter-day believers) with insufficient oil will be excluded from the marriage feast (or “wedding supper of the lamb” as it is called in Revelation 19:9). Notice that all the latter-day believers (whether they had plenty of oil or not enough oil) are asleep when the bridegroom arrives on the scene. None of them expect Jesus Christ to return as early as he does. How could all latter-day believers be oblivious to the reality that Jesus Christ’s return is imminent? I would suggest to you that they all assumed that their expectations about “when Jesus could come” were based on biblically-revealed timetables. They “knew,” based on their calculations, that Jesus Christ “couldn’t come” until certain prophesied events and timetables occurred first. However, Jesus will shock them all when he returns considerably earlier than any of them anticipated. How can this be? I believe this will happen because few take seriously what Jesus himself stated in Matthew 24: 21-22. In that passage, Jesus prophesied them that a time of “great tribulation” would occur in the latter days that would be so severe that “except those days be shortened, there should no flesh be saved.” The Greek word translated “days” in this passage is the same Greek word translated “days” in Revelation 11:3, 6, 9 and 11 where the same word pertains to latter-day prophetic timetables. What Jesus was warning in Matthew 24:22-23 is that his return will come before the prophetic timetables are fulfilled! Notice also the word “days” is plural so that leaves a lot of leeway in when Jesus Christ will return. Will he return two or three days before prophetic timetables are fulfilled or will he return 1,000 days before they are fulfilled? Either is possible because they are both a plurality of days. In Matthew 24:22, Jesus Christ tells us that there is actually room in God’s plan for Jesus Christ to come much earlier than the prophetic timetables would indicate. In other words, God’s divine intervention is not bound by the prophetic timetables. Matthew 24:22 tells us why Jesus will return earlier than biblical prophecies indicate. That verse tells us that if he waited until the prophetic timetables were fully completed, he would be returning to a dead earth because nothing would be left alive. Isaiah 2:1-4 tells us that there will still be plenty of people alive on earth when the Messianic Age/Millennium begins because there will then still be “nations” on earth. Zechariah 14:16-19 prophesy that all the nations on earth will send people to attend the Feast of Tabernacles at that time. Revelation 2:26 also prophesies there will be enough people on earth to constitute the nations that will be ruled by the saints. In other words, Jesus Christ is going to return long before the latter-day events become so cataclysmic that all life or “the nations” would be exterminated on the earth. In Matthew 24:22-23, Jesus Christ stated that despite whatever is prophesied in latter-day prophetic timetables, he reserves the right to come as early as he needs to prevent mankind from annihilating itself. Such extermination could easily come from a global World War III getting out of control or it could come from an innocuous event in some secret laboratory where a wrong-headed experiment could set off, for example, a matter-antimatter reaction that would consume the planet. Let’s speculate on how this could occur. The Hadron Supercollider/CERN project in Europe is probing ever-deeper into the sub-atomic realm that God created. The scientists there are essentially “mining” the uttermost sub-atomic limits of the physical universe as they seek to find what is “on the other side” of what string-theory scientists would call a “membrane” between dimensions. This may have a catastrophic outcome they do not anticipate. I’ll offer a possibility for your consideration. The link below explains that scientists’ equations about the origin of the physical universe state that an equal amount of matter and anti-matter (sub-atomic particles equal to “matter” particles but with opposite charge) should have been created. No one knows what happened to the missing equal amount of anti-matter, but it is known that when such opposite particles come in contact, they destroy each other. You can do a web search for “Where is the missing anti-matter?” to see how many scientific articles have been written on this subject. Genesis 1:1 states God “created the heaven [singular] and the earth,” but Genesis 2:1 states that after Creation week, God had created “the heavens [plural] and the earth.” I have traditionally believed that this verse referring to plural heavens referred to our atmosphere, outer space, and the spirit world. That may be the case, but what if all that missing anti-matter was placed by God just outside our dimension and separated from our dimension so we do not instantly annihilate our dimension and whatever is “on the other side” of what God has created? Please understand that I am not stating that this specific possibility will be the reason why Jesus Christ returns. I’m trying to point out one example of how Jesus Christ might have to return at a time when no one on the earth is expecting him. As mankind continues to learn how the Creator put this universe together, sinful mankind might make a terrible mistake applying forbidden knowledge to a real-world experiment. I Timothy 3:1-9 gives a litany of the evils that will increasingly characterize mankind as the latter days progress to the end of the age. Please read through that list and consider the question: Do you trust increasingly evil mankind to do what is right with forbidden knowledge about how our universe was assembled? I think the answer to that question indicates that mankind may do something so deliberately evil or stupid that Jesus Christ has to return quickly to stop mankind from destroying itself in a way that does not involve warfare. 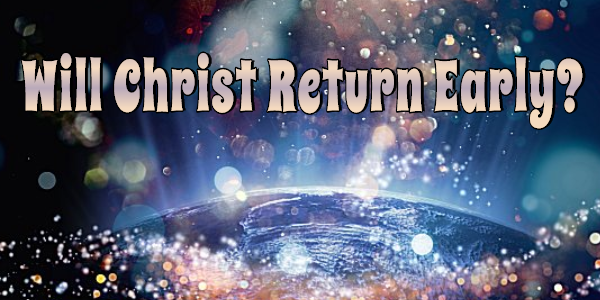 There are a variety of reasons that could necessitate the early return of Jesus Christ. What is clear is that Jesus Christ foretold he would be forced to come sooner than the prophetic timetables would indicate in order to save mankind and “all flesh.” Matthew 24:44 and 25:13 tell us it is far more important to be spiritually “ready” for Jesus Christ’s return than to be able to predict the day of his return. It is also evident that Jesus Christ stated he would come sooner than his followers expected in the latter days, not later. For additional in-depth information about Jesus Christ’s warnings to the churches about the latter days and their readiness for his return, please read my articles, Jesus Christ’s Five Warnings to Latter-Day Believers. Is The Earth 6000 Years Old?